Our driver asked us if it was our first visit to Rome. Technically, no it wasn’t but in the previous two and a bit weeks we’d passed through its airport twice. Finally, we were making our way into the city centre, with no further holiday distractions to be had. Rome was our final stop on a memorable European holiday that took us to Italy’s Amalfi Coast, Croatia’s Split, Dubrovnik and the Island of Vis. It was the city in which we landed in Europe (flying Etihad Airways from Brisbane via Abu Dhabi) and from where we were departing. Saving the “city” part of our trip until last proved to be a good thing. We were VERY chilled after our time beaching it on Vis. Rome certainly helped us to pick up the pace again and prepare for re-entry to the real world back home in Brisbane. It’s an iconic city, steeped in history – from ancient to modern – and it’s a city that quickly gets under your skin, plus we love about the Italian way of life, having first dipped our travel toes in here and here. Read on for 10 things to do and see on a short stay in Rome (we were there for three nights and two days so made sure we made the most of that short time), plus details of the fabulous Airbnb apartment we found that put us right in the thick of the city from the minute we arrived. When you’ve never been to a particular city before, the best way to get your bearings is to get lost in its streets. I know this makes absolutely no sense but it will with the help of a map to find your way home. On our first evening we did just that: wandering 500m and stumbling across the Piazza Navona; wandering 500m more and, would you look at that, there’s the Pantheon. Mind blown. Remember to always look up. Those rooflines, the windows, and the adornments: so much charm and character. These are the things that are etched in your mind long after you’ve returned home. Ok, so there are some obvious, big-ticket items to add to your must-see list when in Rome. The Colosseum is nothing short of monumental – from the outside looking in and the inside looking down. We made a number of rookie errors: we didn’t buy our tickets online in advance, we didn’t book a group tour in advance and we didn’t get to the Colosseum for opening. Much like for the Vatican (see below), in peak tourist season this will leave you queuing up for a very long time – for hours in the sun. All around each of these attractions are tour operators, spruiking “skip the line” tours for an inflated price. Facing our errors front on and facing facts that we had limited time, we paid the asking price, skipped the line and were inside the Colosseum in minutes. Do not ask me how this “system” works but it does. Money paid, line skipped. We didn’t do a tour of the Forum but took it all in on our walk to the Colosseum. There are great vantage points for doing this from the main road. Watch out for stray Romans though – they’ll hit you up for a photo and 5 Euros. Rookies, we were. Ok, so we had wised up a bit for day two, got up earlier and got to St Peter’s Square by 8.30am to find a small queue but one that was moving quickly. By the time we got in at opening time – 9am – that queue extended right around the square. The smug feeling lasted all the way up to the top of St Peter’s Basilica (304 winding steps, worth it for the view) but was quickly replaced with a feeling of dread when we realised that we’d now have to queue for the Vatican Museum and Sistine Chapel. You can guess what comes next, can’t you? Yep, paid the money, skipped the queue. It was worth it for the Sistine Chapel alone – no photography allowed, just hundreds of people, silent looking upwards to the magnificent, famed work of Michelangelo. We love our food experiences in new cities – but you knew that already, didn’t you? On the first night we stuffed up – not big time but enough to have all three of us scratching our heads and wondering how we ended up at a mediocre trattoria when we were in ROME. Simple really: we let the day’s travel from Croatia and our hangry-ness take over during our initial street wander, settling on one of the first offerings (in a high-tourist area) that we came to. Lesson learned. I spent the rest of the night researching options for the next two days. My advice: do your research BEFORE you arrive in Rome and book ahead for those restaurants that take bookings – especially during peak seasons. As a gluten-intolerant person, you will have to do more research to find restaurants that offer GF pasta and pizza. It’s still not a common thing but I was able to order lots of other dishes from any of the restaurants we went to. You do die a little inside when the amazing bread comes out at the start of the meal. Life Ristorante: When the foodie and Champagne lover Danielle Crismani recommends a place to eat, I obediently book said recommendation, which is what I did in this case. We didn’t score an outside seat but were actually thankful for the cool relief inside. This was exquisite Italian food with incredible service but with a price point lower than the equivalent in Australia. Located not far from the Spanish Steps. Osteria Dell’antiquario: Say what you will about the Eat Pray Love book and movie but I very much loved the Eat part. We looked out to this restaurant from our apartment window and it was one in which Elizabeth Gilbert (Julia Roberts in the movie) ate a bowl of spaghetti by herself. So, OF COURSE, I had to drag us there for lunch on our last day. Just fabulous food and service. The waiter even cooled down my wine glass by swishing it for ice in preparation for my ordered Pinot Grigio. Located in San Simeone Piazzetta on Via dei Coronari. Ivo a Trastevere: The Trastevere neighbourhood of Rome is just over the Tiber River and is home to more cobbled pathways, bars and trattorias that locals dine at. The Google gods helped me find this one (it was one of the few where you could book ahead) and we weren’t disappointed. The place was pumping. We were lucky to score an outside spot and our table neighbours were Rome locals, at their favourite for Friday night beers and pizza. We ordered way too much food but gave it a good go. The house wine (carafe) was the best red we’d drunk in Italy. And my pizza lovers gave their pizzas a resounding thumbs up. OF COURSE you will eat gelato. There is a gelataria at every turn. We sniffed out two that people travel to in Rome, specifically to sample the goods. The first was Gelataria Della Palma, home to more than 150 flavours, including lots of choices for dairy-intolerant and vegans. Located not far from the Pantheon. The second was right under our noses in our street – Gelateria del Teatro. There is a “brag” board at the front with numerous writes ups and recommendations from travel and food writers. The philosophy here is to create gelato using the fruits that are fresh and available at the time. I loved the different flavour combinations and gelato with herbal infusions (think raspberry with sage; rosemary, honey and lemon). There were even gluten-free cones available – and a great selection for lactose and egg intolerant. Summer in Rome is hot – mid-30 degree temperatures are norm – so thank goodness for the thousands of fountains (big and small) dotted throughout the city. Simply drink from them while out and about or fill up your water bottle – the water is chilled and fresh. Unless there is a sign saying “non potabile” you can drink out of any of the fountains. The most famous is, of course, the Trevi Fountain. We fell for the charm of the fountain in our piazzetta. When in Rome. HAH. This drink is now ubiquitous across the globe. I had my first one in Italy two years ago, came back to Australia and they were everywhere. Not tried one? Do yourself a favour. It’s combination of Aperol, prosecco and soda water. Practically health-giving, really. We were all geared up for a bit of shop on our final afternoon but were left feeling a little ho-hum about it all. Via del Corso and surrounding streets are home to all the global chain stores – it was very busy but pretty much the same on offer here at home. Via Condotti and the area surrounding the Spanish Steps is for global, designer brands shopping. If you are in the market for a designer bag or shoes etc, there is the advantage of getting some of the sales tax back when leaving Italy. If you have more time to browse in Rome, look for local flea and antique markets and check out some of the independent boutiques in Trastevere. We did this on a trip to Paris two years ago with renowned Australian photographer Carla Coulson. I loved the experience because you saw parts of the city through the eyes of a local and then had some amazing family photos as permanent keepsakes of your time in that city. Not knowing a “Carla” in Rome and seeing fellow blogger, Brooke from Blonde Ambition, book a photoshoot with Travelshoot when in the US last year, I did the same for Rome. This is one of several companies that have photographers in dozens of cities around the world. You choose your package, including preferred locations and Travelshoot Co matches you with a photographer. Our photographer Sebastian David was great to work with. I love the results. I cannot remember how my intensive Airbnb research landed me here. It could have been the Eat Pray Love Googling. It could have been searching for Piazza Navona. In any case, I hit the jackpot. The location could not have been any better. We didn’t need to use public transport at all (good job as there was a strike for one of our two days in Rome). Walking to the Vatican took about 20 minutes; Piazza Navona was five minutes away. The street itself – Via dei Coronari – is beyond charming. The only cars allowed on the street are local ones. Our apartment looked out over San Simeone Piazzetta, with its fountain and restaurant mentioned above, Osteria Dell’antiquario. We also had good coffee, breakfast, lunch, granita, gelato, drinks and dinner options all in this one street too. The apartment is on the first floor of a building, which dates back to the Middle Ages, so the ceiling is low with exposed beams. It’s small, modern (it was renovated in 2015) and extremely functional for three or four people. The only downside was that we didn’t have access to a washing machine. We were at the end of our trip, though, so it wasn’t a big deal. We were met by our host’s friend, Giulia, who showed us through the apartment and also provided lots of recommendations for what to do in the area. So tell me, have you been to Rome. What were you highlights? Where did you stay? Did you find any decent shopping? Travelling to this area in the warmer months? 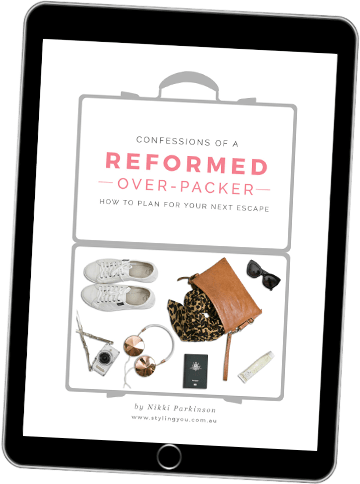 Check out this post and get my tips on how pack for any destination from my e-book, Confessions of a Reformed Over Packer. Confessions of a Reformed Over-Packer e-book. Nikki Parkinson from Styling You’s latest e-book, Confessions of a Reformed Over-Packer (How to Plan For Your Next Escape), has you sorted on the dreaded “what to pack” question for your next trip. Really some of the very good things you have mentioned to do while we are on a short stay in Rome. Will definitely try some of them when i will visit Rome, Italy. By the way, thanks Nikki for a great post. Enjoyed reading this post too Nikki. Definitely want to go to Rome one day. Love those last few photos too. And that dress is divine!! I ❤️ ROMA. I’ve been a few times and love that area you stayed in. Also stayed near Campo de Fiori and on via Governo Veccio. We did the most wonderful food walking tour with ‘Eating Italy’. You tour through Trastevere and surrounds, visiting wonderful delis, restaurants, markets, etc and having little taste tests all the way. Fantastic. Oh Nikki, now I’ve got my heart set on family photos when next we travel – later this year we are back to the UK and the usual undecided itinerary. Italy looks so beautiful. It is such a long time since last I was there, and we’ve never been together. Though Germany and Austria will be this trips added extras. All so tempting though! Oh man I love that stripey dress! Oh that’s awesome!! Very jealous of your bargain. Enjoy Rome. Small world but such a great place to eat!! It’s my ultimate Wanderlust wish to see Rome one day! Probably once all my kids have finished their schooling and can fend for themselves at home, although they did learn Italian at school so could be useful – lol! HAH! Appealing to have translators and appealing to be there by yourself! Hi Nikki….fabulous photos of your trip! Re gluten free….I am gluten intolerant and my Son took me to Paris and Latvia 2 years ago (we have a Daughter with a disability and it is just too hard for me and my husband to get away together). I had my gluten intolerant cards with me to hand out but ditched those pretty quickly. No need for them. You can google for them and they explain in various languages why you can’t eat gluten and hand them to wait staff. Before I left a herbalist told me she had plenty of gluten intolerant friends go to Paris and eat all their breads etc. Masterchef Julie was in ParIs a few years ago at a Croissant making class and I asked her how gluten intolerant people went there. She said that there was a Canadian lady in her class who was eating everything. Time for a bit of research! French Bakers traditionally prove their dough for 18 hours (as opposed to Australia that can make bread in 1 hour). In that prove time the gluten is broken right down. French bake twice a day…like we use to! I have told a few gi people this and they have tried it and love it. Basically I’m talking Sourdough. One lady saw 36 hour sourdough and tried it and nothing happened. Another lady makes sure it’s proven for a minimum of 12 hours and eats that as I do. The dough must be proven for at least 12 hours! I tried a local Italian Pizza place here and asked them how long they did it for and they said overnight…perfect. The Indian place said the traditional way….overnight! A Baker said which time…some Bakers do a few hours plus overnight! It all works for me! Back to Paris…my Son was buying me a pastry a day plus I was eating Baguette…..and nothing happened. Of course I started off slowly! Hence no need for those gluten intolerant cards….they barely know what it is due to their slow traditional methods! I threw them out in the end! Just saying Nikki…this might help you. Look up gluten free and sourdough…there is a bit of information on it. Also chat with your Baker (usually Artisan) and they know all about it! There is a French lady at the Melbourne markets and she proves Croissants overnight! I think we need to go there! I would love to know how you go if you do decide to try it…the first bite is the hardest! Slow Food for me…..it all means more to me now! That is SO interesting and makes so much sense. Last year I was in Italy and France and had no trouble eating gluten free. I have coeliac disease so would not attempt any bread, no matter how long it was proved for, however I found that all the places we ate at had gluten free options and some had separate menus. I was able to eat pizza, pasta and even had tiramasu one night. Loved your photos and would love to go back one day. I’m glad you found some options! We didn’t at the restaurants we were at but I was happy to eat the meat/seafood and salad offerings.